Home Windows Data Recovery Quick Fix Recycle Bin Corrupted Error with a Few Clicks! Summary: This in-depth article is going to explain to you the ways to fix “Corrupted Recycle Bin”. Check out the solutions below, which will help you to fix the issue. Recycle Bin is a directory or a folder that temporarily holds the deleted or removed items. When you delete any file from your computer system, it doesn’t get removed permanently from the hard drive; instead, it moves to the Recycle Bin and gets stored there. These files can’t be accessed directly once they are transferred to Recycle Bin. In order to obtain them, one would need to restore these file to their original place and then use it. Nonetheless, what if your screen flashes a message “Recycle Bin Corrupted”? A corrupted Recycle Bin won’t be emptied, nor will it allow you to restore deleted files to their actual location. But, do not worry! Below are some of the ways, which you can follow to fix corrupted Recycle Bin which is access denied. What causes the error “Recycle Bin Corrupted”? A large number of Windows10, 8 and 7 users logged the issue stating “Recycle Bin Corrupted”. It is a common problem among Windows users and many online forums are filled with related questions that are asking why the Recycle bin is access denied or the Recycle bin won’t empty after the corruption. Given below are some of the possible causes that may lead to this concern. The issue with DLL (Direct Link Library). Step1: Click on start button and select “All Programs” tab. Step2: Select the “Accessories” folder. Step4: After this, type command “rd /s /q C:\$Recycle.bin” and hit on Enter. Step5: Restart your computer system, once after restarting you will be able to use the Recycle Bin. The above solution is concerning the C drive. If you want to reset Recycle Bin for another drive, let’s say for D drive then, replace C in the command with the letter D.
Deleting and Reinstalling Recycle Bin can help troubleshoot the error stating “Recycle Bin Corrupted” if the Recycle Bin was corrupted on Windows 7/8/10. Step1: Open “Control Panel” and select “File Explorer/Folder Options”. Step 3: Now, navigate down and uncheck the option Hide Protected System Operating files. Step 4: Now, open each drive and you will see all the hidden system files now. You will be able to see “$Recycle.bin” as a unique folder. Step 5: In this step, you will have to wipe out the permissions and the specific Recycle Bins present in each drive. Step 6: After deletion, restart the computer. Step1: Select “Personalised” option by right-clicking on your PC’S desktop. Step2: Choose “Chang Desktop Icon” and hit on it. There will be a bit different in Windows 7 or Windows 10, just find this option and then follow the next step. Step3: Now, check on “Recycle Bin” and click “Apply”. Doing this will create a new Recycle Bin at the desktop. Now, open the new Recycle Bin and check whether there are any files in it or not. If you can’t find files or folders inside, then you would need to use some free data recovery software to get all your precious data back. There are scores of recovery tools and applications in the market, but selecting the best one is the prime concern. To make your job simpler, we would recommend using “Bitwar Data Recovery software” as it is capable of recovering deleted image, video, audio, email, files and much more. It is compatible with Windows and Mac including external hard drives like memory cards, USB and digital camera, etc. 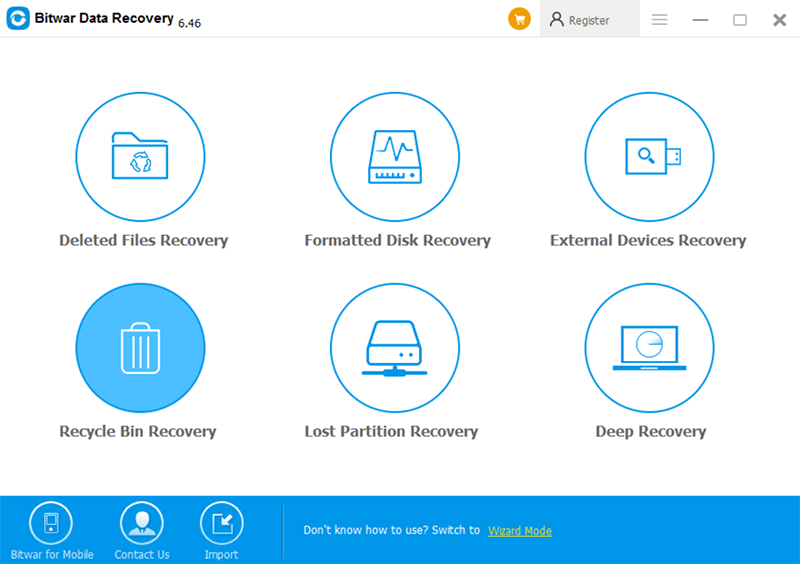 Moreover, it provides 3 steps recovery mode that you can simply recover data lost due to corrupted Recycle Bin. Check here to see how to process the data recovery. This will let you save the retrieved data to any other storage drive. Anyone can receive the message stating “Recycle Bin Corrupted” due to reasons listed above, as there are many activities, which runs in the background of an application, downloaded software or anything else that you do on your computer device which may lead to this possibility. There are some methods which might help you to overcome the issue but, the worst is that you may end up losing all your data such as images, videos, docs, and audios, etc; while implementing these procedures. Hence, it is imperative to choose a tool or software that is clean, safe and reliable to get the lost data back. Bitwar Data Recovery Software comes with powerful functionalities and it is extremely efficient. It is the ultimate solution to all recovery related concerns. It is available free of cost and one can download it easily. All you need to do is, follow the above listed simple steps to get back your data that lost from corrupted Recycle Bin without any hassle or waste of time.